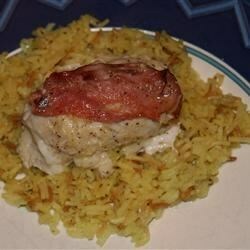 "Much like Chicken Saltimbocca, this is chicken smothered in parmesan cheese and rolled with mozzarella and prosciutto and baked in white wine." Pound chicken breasts flat, and lay them on work surface. Sprinkle liberally with Parmesan cheese on both sides. Place a pinch of minced garlic and 1 teaspoon butter in the center of each breast. Cover each breast with a layer of prosciutto and mozzarella cheese. Reserve some of the prosciutto to place on top of the chicken. Roll up each chicken breast, and secure with toothpicks. In a 9x13 inch baking dish, combine white wine and olive oil. Arrange chicken rolls in dish. Place a small piece of prosciutto on top of each roll, and sprinkle with pepper. Bake in preheated oven for 30 minutes, or until chicken is no longer pink, an juices run clear. Excellent recipe. The only thing i did differently was pepper each side of the chicken with coarse black pepper and add mushrooms to the pan when baking. Absolutely delicious!